Ibutho Coal Pty Ltd applied for a license to mine anthracite coal in the Fuleni district on the border of the Hluhluwe-iMfolozi Park wilderness area in 2013. The consultant for the EIA process is Marietjie Eksteen of Jacana Environmentals cc and the Public participation process is being handled by Lizinda Dickson of Naledi Developments. 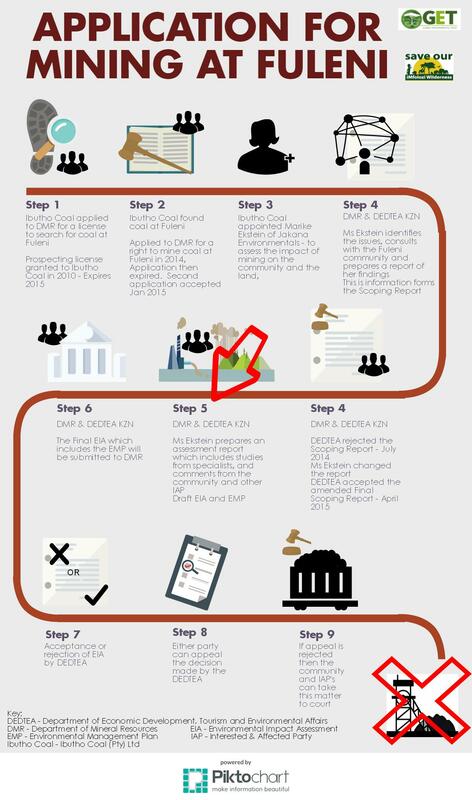 We are at step 5 in the infographic below, “Final EIA and EMP“. We have received notification by DMR of a meeting of the Regional Mining, Development and Environmental Committee (RMDEC) on 22 April, 2016. We have received no communication as yet that the Final EIA has been submitted to DMR. To register as an interested and affected party or if you would like to be involved in the campaign please visit this page for options.